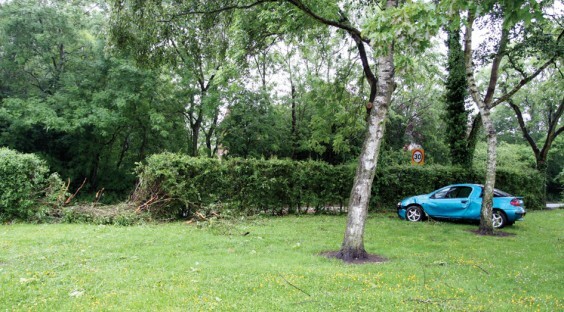 An accident blackspot added another crash to its tally when this car careered through the hedge and across an area where children often play. This was the latest in a long string of crashes on the Redditch Road bends as cars come into Alvechurch. The County Council moved the 30mph flashing warning sign to the spot from the other side of the village two months ago, but as The Village went to press it was still to be connected up. 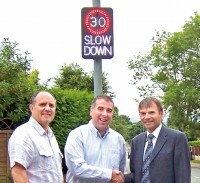 Meanwhile, district and county councillor Peter McDonald was thanked by Lickey and Blackwell Parish councillors Keith Woolford (left) and John Williams for helping them to get a flashing sign installed on the Old Birmingham Road, near Lickey First School.